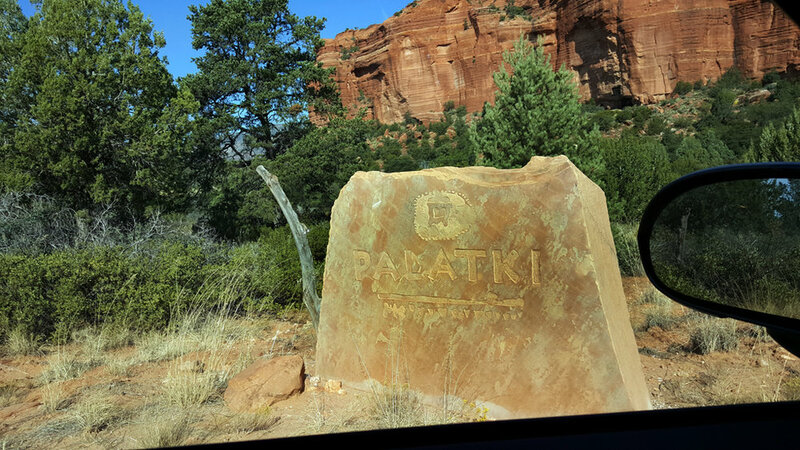 The Palatki Heritage Site cliff dwellings and rock art site located near Sedona in north-central Arizona. The site is open to the general public for visits seven days a week. One of my favorite lesser-known attractions in Sedona Red Rock country. Here a few snapshots from my visit this month. Blue sky, yellow leaves--the fall colors are spectacular here. Sedona Plein Air Festival Begins This Weekend! Here's the latest notice from Sedona Main Street on this year's Plein Air Festival! The “10th Annual Main Street Paint Out” is coming to Uptown this Saturday. Sedona artist, Steve Simon, painting a landscape outside Sedona Green Gallery & Gifts. Steve's work is available at Sedona Green. The “Main Street Paint Out” on Saturday, October 18 from 1:30 – 4 p.m. is the kick-off event for Sedona Arts Center’s 10th Annual Sedona Plein Air Festival, an eight day celebration of outdoor painting with thirty nationally recognized plein air artists from all over the United States. It is sponsored by Sedona Main Street Program to bring together all these artists in one place at the same time. Look for their easels set up all along the plazas and courtyards in Uptown Sedona (N. State Route 89A). It’s a wonderful opportunity to witness the creation of a painting from start to finish within the two and a half hour “Paint Out”. People meet and interact with the artists at work in the open air, as their paintings develop to capture the beauty and charm of Uptown Sedona. This free event kicks-off the Sedona Arts Center’s 10th Annual Sedona Plein Air Festival, an eight day celebration of outdoor painting. The invited artists must be award-winning plein air artists with regional/national recognition and current representation in a fine art gallery. This year, eleven of the artists are from Arizona and the remaining nineteen are coming from California, Colorado, Florida, Illinois, Massachusetts, Nebraska, Oregon, Pennsylvania, Utah, Vermont, Washington DC and Wisconsin. Each year approximately thirty percent of the artists are new to the Festival and this year is no exception – there are 11 new artists this year, both from Arizona and nine of the other states represented here. The paintings created during the “Main Street Paint Out” will be quickly framed and exhibited for sale from 4 - 5:00 pm at Sedona Arts Center, on the corner of “Main Street” (N. SR 89A) and Art Barn Road in Uptown Sedona. This is the first opportunity to purchase this year’s creations, making it perfect for visitors in town for just that weekend or the day. Immediately following is an opening reception at Sedona Art Center’s Art Barn from 5 – 7:00; it is open to the public and complete with complimentary wine offerings, in celebration of the Art & Wine Theme for this year’s Festival. There you can see exhibits of work that all the painters brought with them, and those exhibits will evolve throughout the weeklong Festival as their artwork is purchased and newly created paintings are added. The Festival has many activities open to the public. Visit www.sedonapleinairfestival.com for all the details. 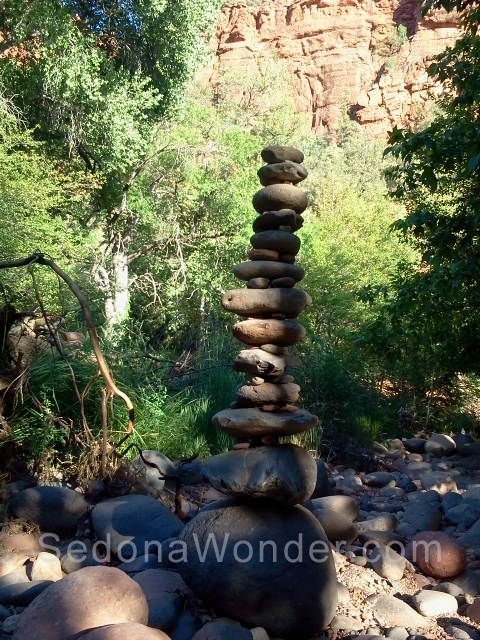 Cairns, or meditation stones, stacked along the shore of Sedona's Oak Creek. This area is also known as "Buddha Beach." 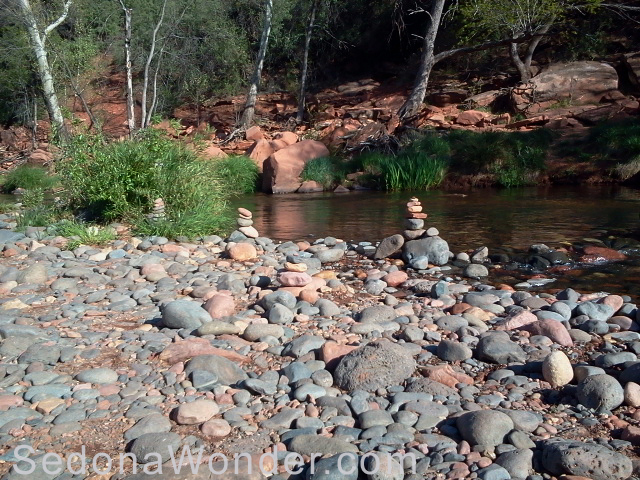 Cairns, or meditation stones, stacked along shallow spots of Sedona's Oak Creek. This area is also known as "Buddha Beach." Buddha Beach Trail along Sedona's Oak Creek. Here's a giant cairn tower along the shore of Oak Creek. This area is also known as "Buddha Beach." Cathedral Rock, Sedona's most-photographed red rock formation stands in the background. Oak Creek cold water runs in the foreground. This photograph was taken in the spring as the trees were budding new leaves. 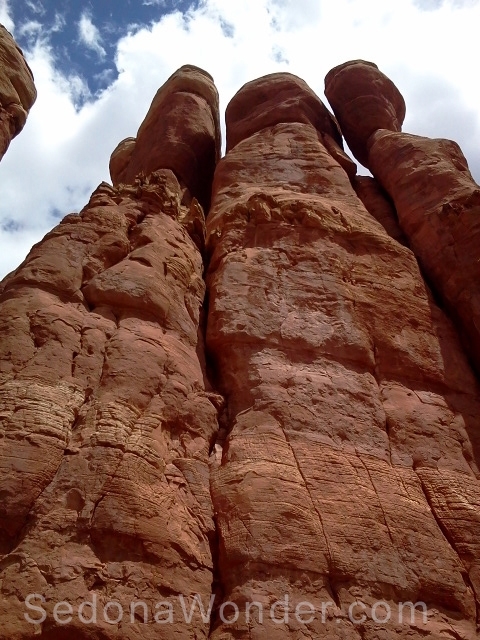 A shot looking up at the red rock towers and spires of Sedona's Cathedral Rock. The tower to the right is known as "The Mace." Rock climbers occasionally climb to the top of this tower. Here's a shot of one of the views from one of the "saddle" portions of Cathedral Rock. By "saddles," I mean the spaces between the formation's multiple spires. Here's a photo looking out from a perch in "Fay Canyon." 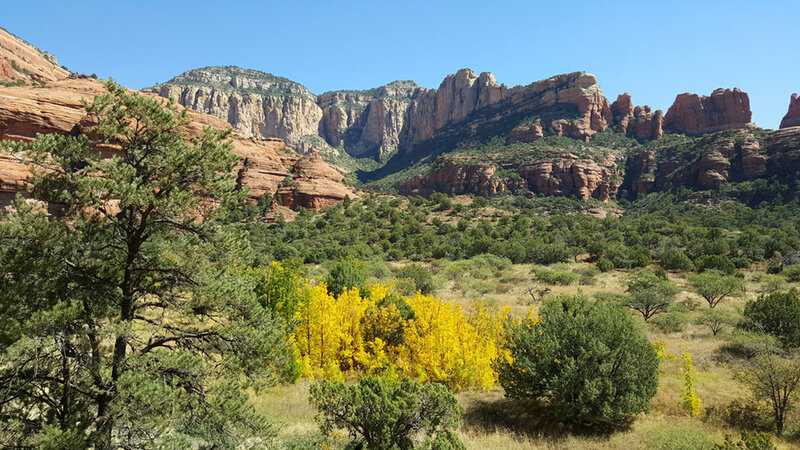 Accessed from Dry Creek Road in West Sedona, Fay Canyon is one of the most popular trails in Sedona. Along the trail, hikers can detour to a natural arch. There's also a unique rock formation that looks like a goblet. At one point, the trail appears to end at the spot where giant rocks dislodged and fell onto the trail 20+ years ago; however, adventurous hikers can continue beyond the rock fall to additional perches and views. 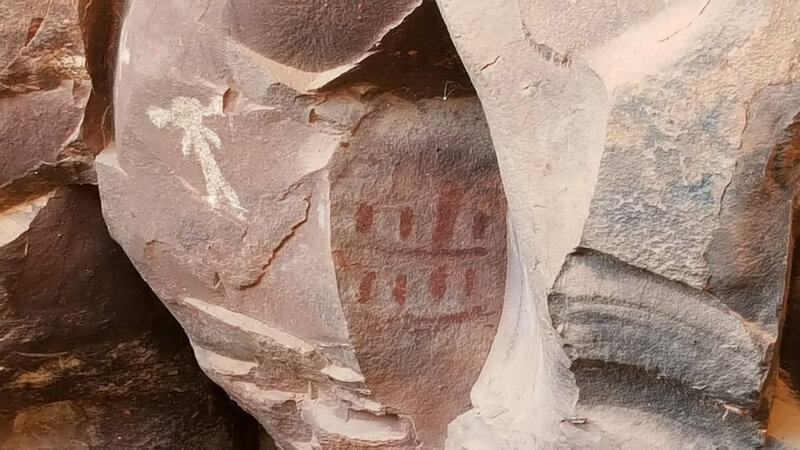 Here's a photo looking of the base of a rock formation in Fay Canyon, which I call "The Goblet," because it looks somewhat like a goblet or wine glass. Accessed from Dry Creek Road in West Sedona, Fay Canyon is one of the most popular trails in Sedona. Along the trail, hikers can detour to a natural arch. There's also a unique rock formation that looks like a goblet. At one point, the trail appears to end at the spot where giant rocks dislodged and fell onto the trail 20+ years ago; however, adventurous hikers can continue beyond the rock fall to additional perches and views. 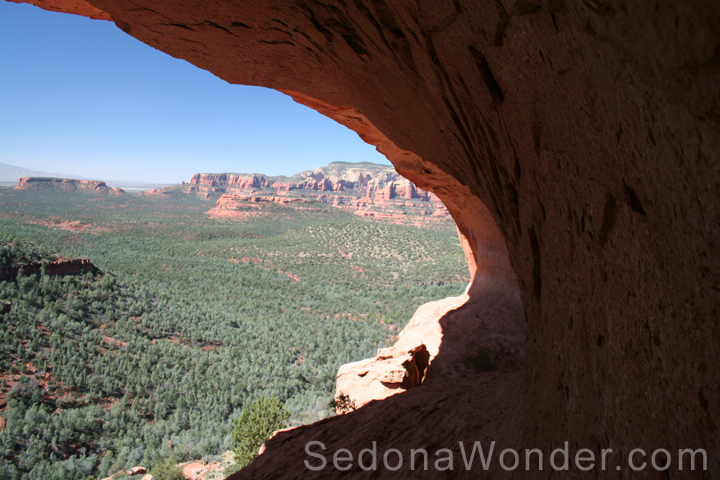 Here's a shot looking out over the Secret Mountain Wilderness from a shallow Sedona Cave. This shot was taken from the top of Mescal Mountain. The Mescal Mountain hike leads to a mesa, or flat "table top" like formation, high above the Sedona wilderness. From this mesa, one can see for miles in all directions. Mescal Mountain trail is not especially popular with tourists, but it is one of my favorites. Cow Pies is a formation as well as a trail accessed via the unpaved and almost impassable, Schnebly Hill Road. A four-wheel drive is the preferred method for accessing any of the trails off Schnebly, so most tourists elect to take a Jeep tour for these views. The Cow Pies formation is a series of rock formations that resemble "cow pies." One can also access this area via Munds Wagon Trail, but it's a long hike that way -- 5 miles or more one way. In this shot, the clouds are reflected in a red rock depression that has filled with water from a recent rain. Here's a hot of some of Sedona's red rock formations as seen from the sky -- a helicopter tour. Helicopter and plane sight-seeing tours fly close over the wilderness and rock formations. 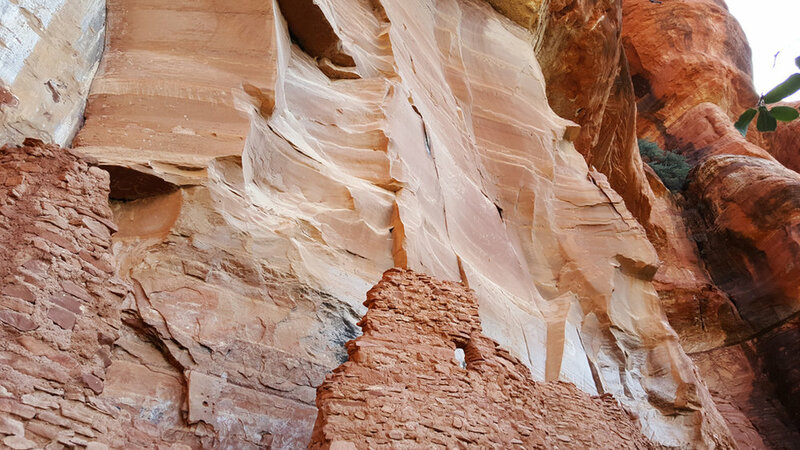 Some are even able to point out Native-American ruins hidden between the towering rock walls. Here's a shot looking out over the Secret Mountain Wilderness from a shallow Sedona Cave. Similar to another shot in this gallery, but with the light a bit different, causing a glow along the interior rock wall. 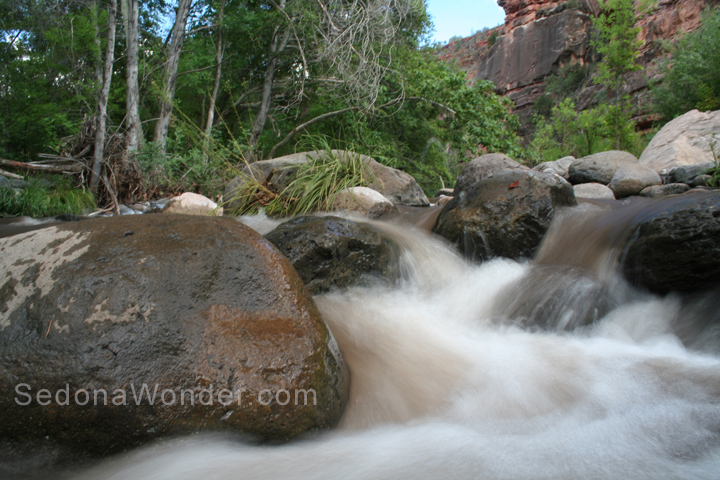 Oak Creek's cool waters rush along smooth boulders through Oak Creek Canyon. This shot was taken at the end point of Huckaby Trail. The area shown here is a south of Slide Rock Park and Midgley Bridge. Here's a shot of The Chapel of The Holy Cross at sunset. The Chapel is Sedona's most visited structure, a church building built directly into the red rocks. Imagined and commissioned by Marguerite Brunswig Staude, it was completed in 1957, and "the doors are open to one and all." This is my favorite shot of Oak Creek. Our gallery -- Sedona Green Gallery & Gifts -- sells this wonderful image in a number of printed formats. I love the shadows and textures of the pocked boulders and the rushing water. Oak Creek's cool waters rush along boulders through Oak Creek Canyon. This shot was taken at the end point of Huckaby Trail. The area shown here is a south of Slide Rock Park and Midgley Bridge.